On Easter Sunday, I attended one of the churches that had been bombed in 2012. That was a bad year for church bombings in Nigeria; many hundreds died and thousands were injured while in worship services at their churches. Post Card program on HR-390 continues – Did your Senators contact you? On Good Friday former Speaker of the House Newt Gingrich published this Easter message in his regular column in the Washington Times. Here he reminds readers of the love of God expressed by the Crucifixion and the growing hatred toward that love from an increasingly secularized America and radical Islamic actions. Iraqi Christians gathered in Baghdad to mark Easter but celebrations were tempered by fears ISIS would eradicate their shrinking community, even as the army launched a U.S.-backed offensive to retake Mosul, their ancestral homeland. Obama just can’t seem to help himself. His obvious love for Islam just seems to bubble up whenever he’s giving a speech. 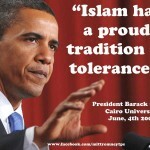 During his recent Easter message, he felt compelled to praise Islam as a tolerant, loving religious system. When President Obama needed a preacher to fulfill the closing prayer duties at the annual White House Easter Prayer Breakfast, he turned to none other than the Episcopal Church’s first openly gay bishop — who said he was as shocked as anyone at the appointment.